This is our last evening at the Convent of the Sisters of Notre Dame of the Ark of the Covenant. (The Ark of the Covenant resided here in Emmaus (Abu Ghosh) for some years before King David took it back to the Temple in Jerusalem.) We have formed very warm relationships with the Philippino ladies who take care of the guests – Malou, Grace, Jenny and Vivian – who cooks with love. Today is the birthday of our Kenyan participant. We have celebrated two other birthdays on this pilgrimage but this one was extra special since it was also our last evening. I was called in my room and asked to come to the dining room and give my approval of the decorations. The dining tables had been decorated with rose petals, votive candles stood on upturned water glasses and a big arrangement of flowers graced the serving table. It looked absolutely magical. The love and care that had gone into it moved me to tears and I had to take a firm walk around the garden. These young women had obviously thoroughly enjoyed themselves and cared about us all. A special meal was presented; roast turkey with all the trimmings. Since hardly anyone in the group eats cake, the staff prepared a small flower arrangement for the birthday ‘boy’ (as people delighted in calling him) with a bowl of ice cream. A birthday cake candle had been brought in anticipation, and there was much hilarity as he pretended to have difficulty blowing out the one candle so that everyone who wanted could take a photo. He had no difficulty being the celebrity 🙂 Several birthday songs were sung and the Australians led their Hip Hip Hooray performance with gusto. A very special closing to our pilgrimage which we will all remember. 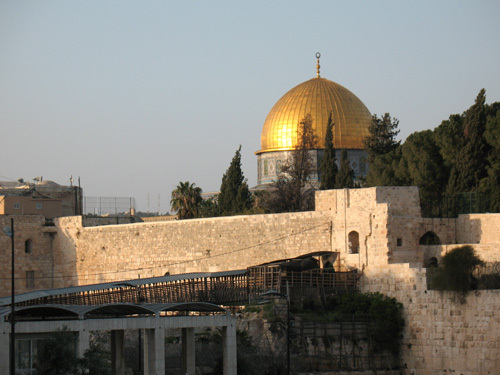 This entry was posted in Israel, Travel on May 1, 2016 by Sarnia. A very early morning departure for the Temple Mount in Jerusalem to avoid long security lines. We passed security (Israeli), we passed the ‘Modesty Police’ (Muslim), and entered this lovely, peaceful plaza with the Al Aqsa mosque at one end, the golden Dome of the Rock at the other end and the Golden Gate in the eastern wall where Jesus entered on Palm Sunday – which has been blocked, I believe by the Romans. This sacred place is much more tense now than when I was here in 2011. We were told firmly by Nahum, our guide, to stay in the group, not to wander off on our own, not to engage the Muslim ‘police’ in conversation and most definitely not be seen praying, nor doing eurythmy or singing. This was the first time we encountered any hostility from the Arab (sometimes Palestinian) population and it was obvious that, since we were not Muslims, we were not welcome. Everyone else has been warm and friendly and a delight to be with. This entry was posted in Israel, Travel on April 30, 2016 by Sarnia. Samia, Sarina, Sophia, Sarnia – who am I? We are staying at a kibbutz hotel and each day our dining tables are labeled with any of the above versions. Around us are hundreds of Jews celebrating Passover and it’s interesting being in their midst. We have been 9 days in Israel – days completely full with no time to write anything. 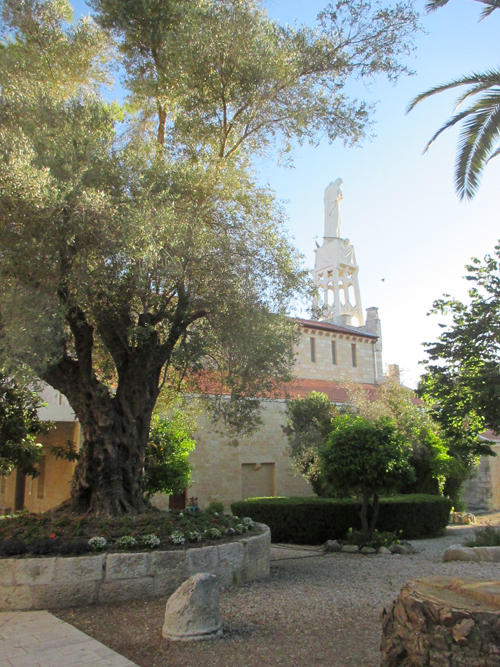 The first few days we stayed in a Convent in Abu Ghosh (Emmaus) and took day trips from there to St George’s Monastery in Wadi Qelt, Jericho, Bethlehem, Qumram and Ein Gedi. We have been visiting many sites and having different experiences. 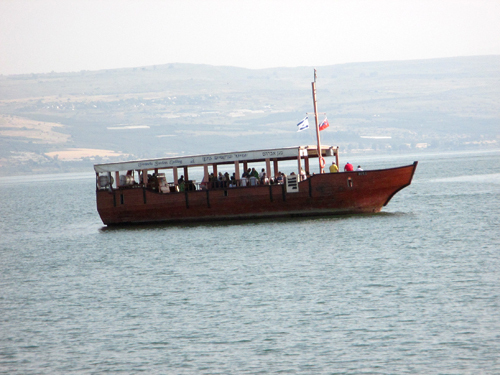 The most delightful was sailing on the Sea of Galilee in a wooden boat (see picture) which was a very peaceful experience, especially when they shut down the engine. There has been much singing in churches, which all have phenomenal acoustics, and some eurythmy and talks. The beds are comfortable, there’s a huge variety of buffet foods (decision-making becomes difficult) and the bathrooms modern with plenty of hot water – none of this do I take for granted. Today, some intrepid souls climbed down ladders holding onto cables to see Mary Magdalene’s cave (maybe) and we visited Magdala, which has recently been discovered, and explored the archeological diggings (scientifically confirmed). While intrepid souls were climbing, we waited at the bottom being befriended by a horse that had shredded its tether rope and thought we must have goodies in our pockets. We also visited Mount Tabor which has a beautiful church at the top to commemorate Christ’s Transfiguration (see pictures). We usually have a reading from Scripture, then a reading from Anne Catherine Emmerich’ visions, followed by a short talk from Robert Powell and singing and possibly eurythmy. With all this activity we usually visit only 2 sites each day. There was much hilarity about beds. Two men share a room and one of them is very tall. He needed a longer bed which was promised, but when they came back to their room at the end of the day there was a long double bed instead of twins. The two of them were considering how they felt about sharing a bed when I found out about it. We had some slightly hysterical laughter, reported the mistake to reception, and it got corrected while we ate dinner. It’s hard to explain what was so funny about it, but we take our funnies where we find them. This entry was posted in Israel, Travel on April 24, 2016 by Sarnia.